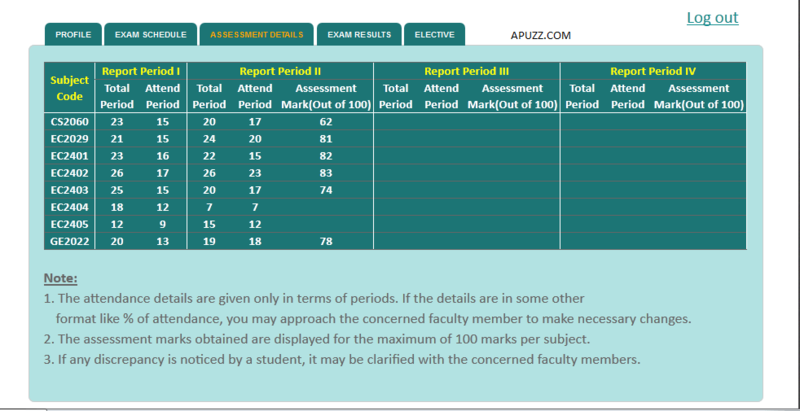 Anna university has announced Academic portal for students & colleges institutes to update students performance in Unit test marks and Attendance percentage marks. Anna University affiliated colleges when they introduced the new pattern to be follow from this year onwards. Now Internal marks will be based on Students Performance in Unit test marks and Attendance percentage.Anna University releases Internal Exam Assessment Exam Schedule for all the academic years. Follow this page for latest anna university results. Anna university affiliated colleges results can be avail from the Anna Univ portal. Anna University Jan/Feb/March/April/May/June/July/August/September/ October/November /December 2018-19 Examination Results for 1st/ 2nd/ 3rd/ 4th/ 5th/ 6th/ 7th/ 8th Semester – UG/PG) Published. Note: The Result of Nov./Dec.2018 Examinations are sent as SMS to registered mobile number of the respective students. Anna university can directly monitor the student performance in test and also attendance details of all student and if they wish, they can directly give internal marks for all students. There is no pass mark for Internal Marks. Pass Mark for Anna University Exam is 50%. You have to get 50% in exam (Theory+practical) and you need in Theory Minimum mark of 45 to pass. You write Anna Univ exam for 100 marks in that you need to secure minimum of 45 marks. If you get 14 marks in practical you will pass else you will fail. Example: 100 marks will be converted for 80 marks. ie., 45 will be change to 36. Now 14 marks will be added to it. Now overall and Final Mark is 50. It is Pass Mark.